Weylin is a Breton witchblade from Markarth. He lives in the Warrens, but will never be seen there because when you enter the city for the first time, he will attempt to murder a woman named Margret. You can either stop him by killing him, or let him commit the murder. If he is successful, the guards will immediately kill him. Shortly before killing Margret, he will yell, "The Reach belongs to the Forsworn! ", showing his affiliation with the Forsworn. Upon death he will say, "I die for my people." He wears a set of miner's clothes, a pair of boots, and a pair of gloves. 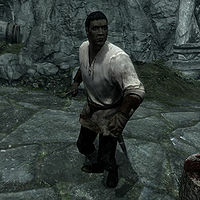 He is equipped with a steel dagger, and carries a selection of lower-class items and gold. Should you choose to investigate why he attacked Margret, you will eventually find a note in Weylin's room in the Warrens, telling him that he has been "chosen to strike fear in the heart of the Nords". This page was last modified on 20 January 2015, at 23:45.